The seed list for this crawl was a list of Alexa�s top 1 million web sites, retrieved close to the crawl start date. We used Heritrix (3.1.1-SNAPSHOT) crawler software and respected robots.txt directives. The scope of the crawl was not limited except for a few manually excluded sites. We have made many changes to how we do these wide crawls since this particular example, but we wanted to make the data available �warts and all� for people to experiment with. We have also done some further analysis of the content. If you would like access to this set of crawl data, please contact us at info at archive dot org and let us know who you are and what you�re hoping to do with it. We may not be able to say �yes� to all requests, since we�re just figuring out whether this is a good idea, but everyone will be considered. A cheque drawn on the Regent Street (Clifton), Bristol branch of Westminster Bank, England dated 14 August 1956. Notice (a) the bank clerk's red mark verifying the signature, (b) the two-pence stamp duty, (c) that this is a "crossed cheque" disallowing transfer of payment to another account, (d) holes punched by hand through the cheque by the bank, and (e) that there are no magnetic-ink characters for computer sorting—banks did not have computers in 1956 and had staff sort millions of cheques daily by hand. A cheque (or check in American English) is a document/instrument (usually a piece of paper[nb 1]) that orders a payment of money. The person writing the cheque, the drawer, usually has a current account (British), or checking account (US) where their money was previously deposited. The drawer writes the various details including the money amount, date, and a payee on the cheque, and signs it, ordering their bank, known as the drawee, to pay that person or company the amount of money stated. Cheques are a type of bill of exchange and were developed as a way to make payments without the need to carry around large amounts of gold and silver. Paper money also evolved from bills of exchange, and are similar to cheques in that they were originally a written order to pay the given amount to whomever had it in their possession (the "bearer"). Although cheques have been around since at least the 9th century, it was during the 20th century that cheques became a highly popular non-cash method for making payments and the usage of cheques peaked. By the second half of the 20th century, as cheque processing became automated, billions of cheques were issued each year; these volumes peaked in or around the early 1990s. Since then cheque usage has fallen, being partly replaced by electronic payment systems. In some countries cheques have become a marginal payment system or have been phased out completely. The cheque had its origins in the ancient banking system, in which bankers would issue orders at the request of their customers, to pay money to identified payees. Such an order was referred to as a bill of exchange. The use of bills of exchange facilitated trade by eliminating the need for merchants to carry large quantities of currency (e.g. gold) to purchase goods and services. During the 3rd century AD, banks in Persia and other territories in the Persian Sassanid Empire issued letters of credit known as chak (In New Persian script: چک. In Shahnameh there are several mentions of use of chak and in post-Islamic Arabic document this word appears as Arabicised ṣakks or صکّ). Between 1118 and 1307, it is believed the Knights Templar introduced a cheque system for pilgrims travelling to the Holy Land or across Europe. The pilgrims would deposit funds at one chapter house, then withdraw it from another chapter at their destination by showing a draft of their claim. These drafts would be written in a very complicated code only the Templars could decipher. In the 13th century in Venice bills of exchange was developed as a legal device to allow international trade without the need to carry around large amounts of gold and silver. Their use subsequently spread to other European countries. In the early 1500s in the Dutch Republic in order to protect their large accumulations of cash, people began to depositing their money with "cashiers". These cashiers held the money for a fee. Competition drove cashiers to offer additional services including paying out money to any person bearing a written order from a depositor to do so. They kept the note as proof of payment. By the 17th century, bills of exchange were being used for domestic payments in England. Cheques, a type of bill of exchange, then began to evolve. They were initially known as "drawn notes" as they enabled a customer to draw on the funds they held on account with their banker and required immediate payment. These were handwritten, and one of the earliest known still to be in existence was drawn on Messrs Morris and Clayton, scriveners and bankers based in the City of London, and dated 16 February 1659. In 1717 the Bank of England pioneered the first use of a pre-printed form. 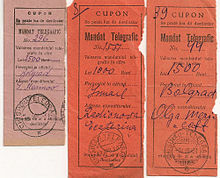 These forms were printed on "cheque paper" to prevent fraud, and customers had to attend in person and obtain a numbered form from the cashier. Once written the cheque would have to be brought back to the bank for settlement. Until around 1770 an informal exchange of cheques took place between London banks. Clerks of each bank visited all the other banks to exchange cheques, whilst keeping a tally of balances between them until they settled with each other. Daily cheque clearing began around 1770 when the bank clerks met at the Five Bells, a tavern in Lombard Street in the City of London, to exchange all their cheques in one place and settle the balances in cash. See bankers' clearing house for further historical developments. In 1811 the Commercial Bank of Scotland is thought to have been the first bank to personalise its customers' cheques, by printing the name of the account holder vertically along the left-hand edge. In 1830 the Bank of England introduced books of 50, 100 or 200 forms and counterparts, bound or stitched. These cheque books became a common format for the distribution of cheques to bank customers. In the late 19th century a number of countries formalised laws around cheques. The UK passed the Bills of Exchange Act in 1882, and India passed the Negotiable Instruments Act (NI Act) 1881 which both covered cheques. In 1931 an attempt was made to simplify the international use of cheques by the Geneva Convention on the unification of the law relating to cheques. Many European and South American states as well as Japan joined the convention. However some countries, including the United States and members of the British Commonwealth did not participate. In 1959 a standard for machine readable characters (MICR) was agreed and patented in the United States for use with cheques. This opened the way for the first automated reader/sorting machines for clearing cheques. The following years saw a dramatic change in the way that cheques were handled and processed as automation increased. Cheque volumes continued to grow, and in the late 20th century cheques were the most popular non-cash method for making payments, with billions of them processed each year. Most countries saw cheque volumes peak in the late 1980s or early 1990s, after which electronic payment methods started to become popular and the use of cheques started to decline. In 1969 cheque guarantee cards were introduced in a number of countries, allowing a retailer to confirm that a cheque would be honoured when used at a point of sale. The drawer would sign the cheque in front of the retailer, who would compare the signature to the signature on the card and then write the cheque guarantee card number of the back of the cheque. Such cards were generally phased out and replaced by debit cards, starting in the mid 1990s. From the mid 1990s, many countries enacted laws to allow for cheque truncation, in which a physical cheque is converted into electronic form for transmission to the paying bank or clearing house. This eliminates the cumbersome physical presentation and saves time and processing costs. In 2002, Germany and some other European countries phased out the use of cheques altogether when the Eurocheque system, which they had used as their domestic cheque clearing system, ceased on 1 January 2002. As of 2010, many countries have either phased out the use of cheques altogether or signaled that they would do so in the following years. An issue date was added, and cheques may not be valid a certain amount of time after issue. In the US a cheque is typically valid for six months after the date of issue, after which it is a stale-dated cheque, but this depends on where the cheque is drawn; in Australia this is typically fifteen months. A cheque that has an issue date in the future, a post-dated cheque, may not be able to be presented until that date has passed, writing a post dated cheque may simply be ignored or is illegal in some countries. Conversely, an antedated cheque has an issue date in the past. Parties to regular cheques generally include a drawer, the depositor writing a cheque; a drawee, the financial institution where the cheque can be presented for payment; and a payee, the entity to whom the drawer issues the cheque. The drawer drafts or draws a cheque, which is also called cutting a cheque, especially in the United States. There may also be a beneficiary—for example, in depositing a cheque with a custodian of a brokerage account, the payee will be the custodian, but the cheque may be marked "F/B/O" ("for the benefit of") the beneficiary. An advantage to the drawer of using cheques instead of debit card transactions, is that they know the drawer's bank will not release the money until several days later. Paying with a cheque and making a deposit before it clears the drawer's bank is called "kiting" or "floating" and is generally illegal in the United States, but rarely enforced unless the drawer uses multiple chequing accounts with multiple institutions to increase the delay or to steal the funds. Cheques have been in decline for some years, both for point of sale transactions (for which credit cards and debit cards are increasingly preferred) and for third party payments (e.g. bill payments), where the decline has been accelerated by the emergence of telephone banking and online banking. Being paper-based, cheques are costly for banks to process in comparison to electronic payments, so banks in many countries now discourage the use of cheques, either by charging for cheques or by making the alternatives more attractive to customers. Cheques are also more costly for the issuer and receiver of a cheque. In particular the handling of money transfer requires more effort and is time consuming. The cheque has to be handed over on a personal meeting or has to be sent by mail. The rise of automated teller machines (ATMs) means that small amounts of cash are often easily accessible, so that it is sometimes unnecessary to write a cheque for such amounts instead. In most European countries, cheques are now very rarely used, even for third party payments. In these countries, it is standard practice for businesses to publish their bank details on invoices, to facilitate the receipt of payments by giro. Even before the introduction of online banking, it has been possible in some countries to make payments to third parties using ATMs, which may accurately and rapidly capture invoice amounts, due dates, and payee bank details via a bar code reader to reduce keying. In some countries, entering the bank account number results in the bank revealing the name of the payee as an added safeguard against fraud. In using a cheque, the onus is on the payee to initiate the payment, whereas with a giro transfer, the onus is on the payer to effect the payment[clarification needed]. The process is also procedurally more simple, as no cheques are ever posted, can claim to have been posted, or need banking or clearance. In Poland cheques were withdrawn from use in 2006, mainly because of lack of popularity due to widespread adaptation of credit and debit cards. In the United Kingdom, Ireland, and France, some people still use cheques, partly because cheques remain free of charge to personal customers; however, bank-to-bank transfers are increasing in popularity. Since 2001, businesses in the United Kingdom have made more electronic payments than cheque payments. Most utilities in the United Kingdom charge lower prices to customers pay by direct debit than for other payment methods, including electronic methods. The vast majority of retailers in the United Kingdom and many in France no longer accept cheques as a means of payment. For example Shell announced in September 2005 that it would no longer accept cheques in its UK petrol stations. More recently, this has been followed by other major fuel retailers, such as Texaco, BP, and Total. Asda announced in April 2006 that it would stop accepting cheques, initially as a trial in the London area, and Boots announced in September 2006 that it would stop accepting cheques, initially as a trial in Sussex and Surrey. Currys (and other stores in the DSGi group) and WH Smith also no longer accept cheques. Cheques are now widely predicted to become a thing of the past, or at most, a niche product used to pay private individuals or for the very large number of small service providers who are not used to providing their bank details to customers to allow electronic payments to be made to them, and/or do not wish to be burdened with checking their bank account frequently and reconciling their contents with amounts due (e.g. music teachers, driving instructors, children's sports lessons, very small shops, schools etc.). The UK Payments Council announced in December 2009 that cheques would be phased out by October 2018, but only if adequate alternatives are developed. They intend to perform annual checks on the progress of other payments systems and a final review of the decision will be held in 2016. Concerns have been expressed, however, by charities and older people, who are still heavy users of cheques, and replacement plans have been criticised as open to fraud. The United States still relies heavily on cheques, due to the absence of a high volume system for low value electronic payments. About 70 billion cheques were written annually in the U.S. by 2001, though almost 25% of Americans do not have bank accounts at all. When sending a payment by online banking in the U.S. at some banks, the sending bank mails a cheque to the payee's bank or to the payee rather than sending the funds electronically. Certain companies whom a person pays with a cheque will turn it into an Automated Clearing House (ACH) or electronic transaction. Banks try to save time processing cheques by sending them electronically between banks. Cheque clearing is usually done with a new type of electronic cheque broker, Viewpointe LLC, SVPco, or the Federal Reserve Banks. Copies of the cheques are stored at a bank or the broker, for periods up to 99 years, and this is why some cheque archives have grown to 20 petabytes. The access to these archives is now world wide, as most bank programming is now done offshore. Many utilities and most credit cards will also allow customers to pay by providing bank information and having the payee draw payment from the customer's account (direct debit). Many people in the U.S. still use paper money orders to pay bills or transfer money which is a unique type of cheque. They have security advantages over mailing cash, and do not require access to a bank account in order to obtain. Canada's usage of cheques is slightly less than that of the U.S. The Interac system, which allows instant fund transfers via magnetic strip and PIN, is widely used by merchants to the point that very few brick and mortar merchants accept cheques anymore. Many merchants accept Interac debit payments but not credit card payments, even though most Interac terminals can support credit card payments. Financial institutions also facilitate transfers between accounts within different institutions with the Email Money Transfer (EMT) service. In many Asian countries cheques were not widely used and generally only used by the wealthy, with cash being used for the majority of payments. Where cheques were used they have been declining rapidly, by 2009 there was negligible consumer cheque usage in Japan, South Korea and Taiwan. This declining trend was accelerated by these developed markets advanced financial services infrastructure. However many of the developing markets have also seen an increasing use of electronic payment systems, 'leap-frogging' the less efficient chequing system altogether. In Australia, following global trends, the use of cheques continues to decline. In 1994 the value of daily cheque transactions was AU$25 billion, by 2004 this had dropped to only AU$5 billion. As in other countries, New Zealand payment statistics indicate a strong move away from cheques in favour of electronic payment methods. From being the most popular form of non-cash payment until the mid-1990s, cheques now lag far behind EFTPOS payment transactions and electronic credits. Their usage is declining at about 6% per year. In 1993 cheque payments accounted for over 50% of transactions through the banking system with an averaged 130 cheques per capita. By the end of 2006, this had dropped to 9% with 41 cheques per capita. Cashier's cheques and banker's drafts also known as a bank cheque or treasurer's cheque, are cheques issued against the funds of a financial institution rather than an individual account holder. Typically, the term cashier's cheques are used in the US and banker's drafts are used in the UK. The mechanism differs slightly from country to country but in general the bank issuing the cashiers cheque or bankers draft will allocate the funds at the point the cheque is drawn. This provides a guarantee, save for a failure of the bank, that it will be honoured. Cashier's cheques are perceived to be as good as cash but they are still a cheque, a misconception often exploited by scam artists. A lost or stolen cheque can still be stopped like any other cheque so payment is not completely guaranteed. When a certified cheque is drawn, the bank operating the account verifies there are currently sufficient funds in the drawer's account to honour the cheque. Those funds are then set aside in the bank's internal account until the cheque is cashed or returned by the payee. Thus, a certified cheque cannot "bounce", and, in this manner, its liquidity is similar to cash, absent failure of the bank. The bank indicates this fact by making a notation on the face of the cheque (technically called an acceptance). Warrants look like cheques and clear through the banking system like cheques, but are not drawn against cleared funds in a deposit account. A cheque differs from a warrant in that the warrant is not necessarily payable on demand and may not be negotiable. They are often issued by government entities such as the military to pay wages or supplies. In this case they are an instruction to the entity's treasurer department to pay the warrant holder on demand or after a specified maturity date. A traveller's cheque is designed to allow the person signing it to make an unconditional payment to someone else as a result of paying the account holder for that privilege. Traveller's cheques can usually be replaced if lost or stolen and people often used to use them on vacation instead of cash as many businesses used to accept traveller's cheques as currency. The use of credit or debit cards has, however, begun to replace the traveller's cheque as the standard for vacation money due to their convenience and additional security for the retailer. This has resulted in many businesses no longer accepting traveller's cheques. A cheque sold by a post office or merchant such as a grocery for payment by a third party for a customer is referred to as a money order or postal order. These are paid for in advance when the order is drawn and are guaranteed by the institution that issues them and can only be paid to the named third party. This was a common way to send low value payments to third parties avoiding the risks associated with sending cash via the mail, prior to the advent of electronic payment methods. Some public assistance programs such as the Special Supplemental Nutrition Program for Women, Infants and Children, or Aid to Families with Dependent Children make vouchers available to their beneficiaries, which are good up to a certain monetary amount for purchase of grocery items deemed eligible under the particular programme. The voucher can be deposited like any other cheque by a participating supermarket or other approved business. Canadian cheques can legally be written in English or French or Eskimo-Aleut languages. Cheques were introduced in India by the Bank of Hindustan, the first joint stock bank established in 1770. In 1881, the Negotiable Instruments Act (NI Act) was enacted in India, formalising the usage and characteristics of instruments like the cheque, the bill of exchange and promissory note. The NI Act provided a legal framework for non-cash paper payment instruments in India. Cheques will be withdrawn from use in the UK on 31 October 2018. In the United States, cheques (spelled "checks") are governed by Article 3 of the Uniform Commercial Code, under the rubric of negotiable instruments. An order check—the most common form in the United States—is payable only to the named payee or his or her endorsee, as it usually contains the language "Pay to the order of (name)." A bearer check is payable to anyone who is in possession of the document: this would be the case if the cheque does not state a payee, or is payable to "bearer" or to "cash" or "to the order of cash", or if the cheque is payable to someone who is not a person or legal entity, e.g. if the payee line is marked "Happy Birthday". A counter check is a bank cheque given to customers who have run out of cheques or whose cheques are not yet available. It is often left blank—hence sometimes called a "blank check", though this term has other uses—and is used for purposes of withdrawal. In the United States, the terminology for a cheque historically varied with the type of financial institution on which it is drawn. In the case of a savings and loan association it was a negotiable order of withdrawal (compare Negotiable Order of Withdrawal account); if a credit union it was a share draft. Checks as such were associated with chartered commercial banks. However, common usage has increasingly conformed to more recent versions of Article 3, where check means any or all of these negotiable instruments. Certain types of cheques drawn on a government agency, especially payroll cheques, may also be referred to as a payroll warrant. At the bottom of each cheque there is the routing / account number in MICR format. The routing transit number is a nine-digit number in which the first four digits identifies the U.S. Federal Reserve Bank's cheque-processing center. This is followed by digits 5 through 8, identifying the specific bank served by that cheque-processing center. Digit 9 is a verification check digit, computed using a complex algorithm of the previous eight digits. Cheque truncation was introduced in 2004 with the passing of the "Check Clearing for the 21st Century Act" (or Check 21 Act), this allowed the creation of electronic substitute checks to replace the physical cheques saving costs and processing time. Sometimes, forgery is the method of choice in defrauding a bank. One form of forgery involves the use of a victim's legitimate cheques, that have either been stolen and then cashed, or altering a cheque that has been legitimately written to the perpetrator, by adding words and/or digits in order to inflate the amount. Since cheques include significant personal information (name, account number, signature and in some countries driver's license number, the address and/or phone number of the account holder), they can be used for fraud, specifically identity theft. In the USA and Canada until recent years the social security number was sometimes included on cheques. The practice was discontinued as identity theft became widespread. However, in Scotland, a cheque acts as an assignment of the amount of money to the payee. As such, if a cheque is dishonoured in Scotland, what funds are present in the bank account are "attached" and frozen, until either sufficient funds are credited to the account to pay the cheque, the drawer recovers the cheque and hands it into the bank, or the drawer obtains a letter from the payee that he has no further interest in the cheque. A cheque may also be dishonored because it is stale or not cashed within a "void after date". Many cheques have an explicit notice printed on the cheque that it is void after some period of days. In the United States, banks are not required by the Uniform Commercial Code to honour a stale-dated cheque, which is a cheque presented six months after it is dated. Typically when customers pay bills with cheques (like gas or water bills), the mail will go to a "lock box" at the post office. There a bank will pick up all the mail, sort it, open it, take the cheques and remittance advice out, process it all through electronic machinery, and post the funds to the proper accounts. 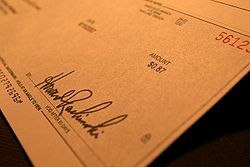 In modern systems, taking advantage of the Check 21 Act, as in the U.S., many cheques are transformed into electronic objects and the paper is destroyed. ^ "Cheques and Bankers' Drafts Facts and Figures". UK Payment Administraton. UKPA. 2010. http://www.ukpayments.org.uk/resources_publications/key_facts_and_figures/cheques_and_bankers'_drafts_facts_and_figures/. Retrieved 30 June 2010. ^ a b c d e "Evolution of Payment Systems in India =Reserve Bank of India". http://www.rbi.org.in/scripts/PublicationsView.aspx?id=155. ^ a b c Organisation for Economic Co-operation and Development, ed (2002). The Future of Money. Paris: OECD. pp. 76–79. ISBN 978-92-64-19672-8. http://books.google.com/books?id=ym_bqY3UZG0C&pg=PA76&dq=billion+checks&as_brr=1&sig=4bxAvdOX3fl3LMpMcpfWyIibW1M#v=onepage&q=billion%20checks&f=false. ^ "�?Green payment’ movement set to impact the American consumer payments landscape". euromonitor.com. 4 May 2010. http://blog.euromonitor.com/2010/05/green-payment-movement-set-to-impact-the-american-consumer-payments-landscape.html. Retrieved 24 July 2010. This page was last modified on 21 April 2011 at 20:31.